2ingis, based in Brussels, grew from being a dental laboratory to a specialist in dentistry. 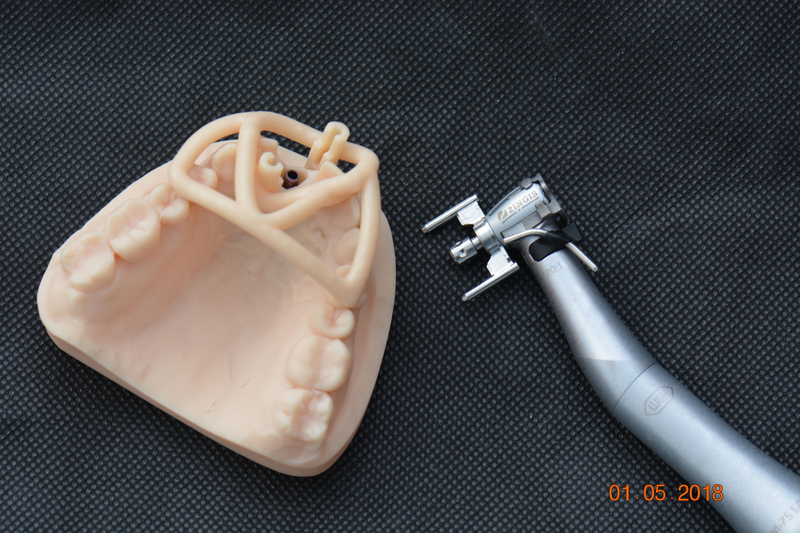 Today, the company produces surgical guides to position dental implants in a safe and precise manner. When developing its dental implant drill guides, 2ingis wanted to increase the precision of the linear movement of the guide pins in the printed drill jig. 2ingis had a design in mind and joined forces with Sirris to determine whether the solutions proposed by the company were feasible in practice and which precision technologies were suitable for production. The project focus was on the accuracy of five-axis milling of two types of small parts, one part made of PEEK (polyether ether ketone, a polymer) and a second one from a corrosion-resistant steel grade. Sirris assisted the company with the production of both prototypes using the Fehlmann Versa 825 five-axis precision milling machine. The first part of the proposed solution consisted of applying and gluing precise PEEK tubes into the printed jigs. The clearance between the glued PEEK bushes and the guide pins is the smallest possible, which guarantees precise linear guidance. The friction of PEEK bushes, moreover, is lower than that of metal guiding pins. The production of the steel pins required expertise and the company also cooperated with Sirris to produce the prototype. 2ingis, after weighing all options, decided to use precision milling of the metal pins since this guaranteed achieving submillimetre precision, which has the advantage of being more accurate than the method used by the competition. Despite the positive results of the five-axis milling of the plastic parts, the company decided to use an additive manufacturing method for the PEEK bushes because the production price is lower in this specific case. The company outsourced the printing of the dental implant drill guides to Prodways as it delivers an extremely high print quality. The specific properties of the synthetic resin and the accuracy of the printer ensures that the drill guides, models and tools can be printed in one run. Whether the printed synthetic resin in Prion can be sterilised without losing tensile or compressive strength is currently being researched. The partnership with Sirris has helped 2ingis to create the most innovative and accurate drill guides for dental implants in the world.